If you want to select data that is related to the current data cell, the easy way to do it is to use the context menu. To see this menu, simply right click on any data cell. If you’re using a track pad, you can click with two fingers. (If you don’t have a two button mouse or a track pad, hold down the Control key and click on the cell.) This movie shows the most common example, selecting data that is the same as the clicked cell. The selection options in the menu vary depending on the type of data you click on. For date fields there are additional options for different periods — same week, month, quarter or year. For example to find all records in January, just right click on any date in January and choose Select Same Month. 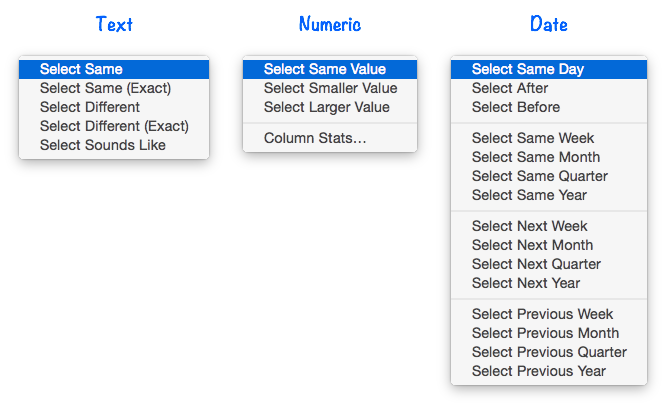 These options apply to numeric cells. For example, right click on a cell that contain $100 and choose Select Larger to select all records with values greater than 100. These options apply to date cells. For example, to find all records before a certain date simply right click on the date and choose Select Before. If you clicked on a cell that contained January 1, 2017 then Panorama would select all records from 2016 or earlier. When working with date fields you can “walk” thru the data by day, week, month, quarter or year. For example, you could start by right clicking on a cell in January and choosing Select Same Month to see all of the records in January. Then choose Select Next Month to see all of the records in February, then again for March, April, May, etc. Once you’ve made a selection you can click on a numeric field and choose Column Stats from the context menu to get some quick statistics about the selected records. For example, you could start by selecting all records in April, then right click and choose Column Stats. A small panel appears displaying information about the debits in the currently selected records, including the total, count, average and standard deviation. If necessary, you can select and copy values from the panel simply by selecting the text and choosing Copy from the Edit menu (or pressing Command-C).